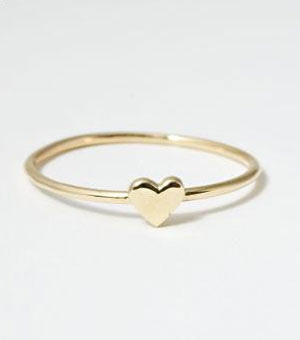 I have an infatuation with teeny tiny gold trinkets. I do have the occasional big jewelry number, but for me, thin chains with microscopic embellishments provide the right amount of sentiment and sparkle. 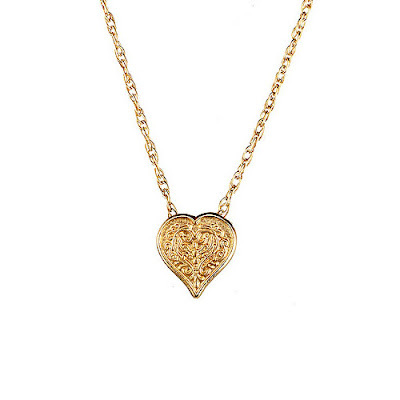 I got this Gold Niello Heart necklace at the Met two years ago when I first moved back to the east coast. I hadn't started working yet, so I basically stayed in New York for an entire week. While Chris slaved away under the tyranny of Rupert Murdoch, I walked around, ate alone, and went to museums. After gazing at the exhibits in the Met for a few hours, I wandered into the jewelry store and voila! Here was this lovely heart. I bought it for my mother, but she being the typical Korean mom, didn't appreciate its subtle beauty (she likes BIG diamonds and pearls and ROCKS). So huzzah! It was mine. Now I have my sights set on this, found via Cup of Jo. *** EDIT: Check this out! Lena Corwin just posted the HOLY GRAIL of teeny tiny gold trinkets.